Fight the Shadow or Fall!! As the Demon Lord's influence creeps across the land, it touches more people, awakening in them crippling dread, tempting them to commit unspeakable acts, or to rise up and take a stand and fight back against the spreading darkness. In the end times, all must choose a side, to save the world or watch it burn. 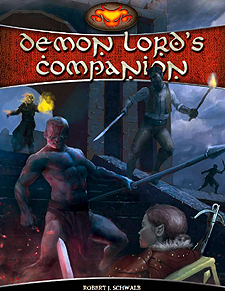 An essential addition to the Shadow of the Demon Lord line of products, the Demon Lord's Companion is bound to take your games into darker and stranger places!